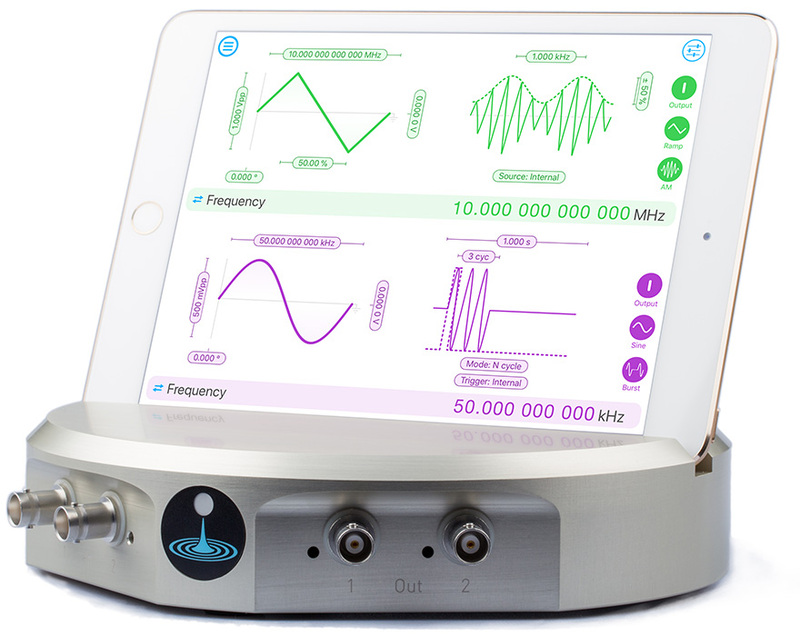 Wirelessly configure and upload your waveforms, all from an intuitive iPad interface, or with Python, MATLAB, and LabVIEW. Moku:Lab outputs have an analog bandwidth of 300 MHz and a range of 2 Vpp into a 50 Ω load. Moku:WaveformGenerator takes full advantage of the hardware's ultra-stable oscillator and the 10 MHz back panel reference input. See the specifications for full details. This cross channel modulation (e.g. using channel 2 as the modulating waveform of channel 1) allows precise control of exceptionally complex modulation waveforms. Need to phase modulate your 120 MHz carrier with a 25 MHz ramp waveform that is itself amplitude modulated at 1 Hz? Moku:WaveformGenerator has you covered.